But you already knew that. Apparently, however, I’m a bit slow, because I was honestly surprised by these two situations. 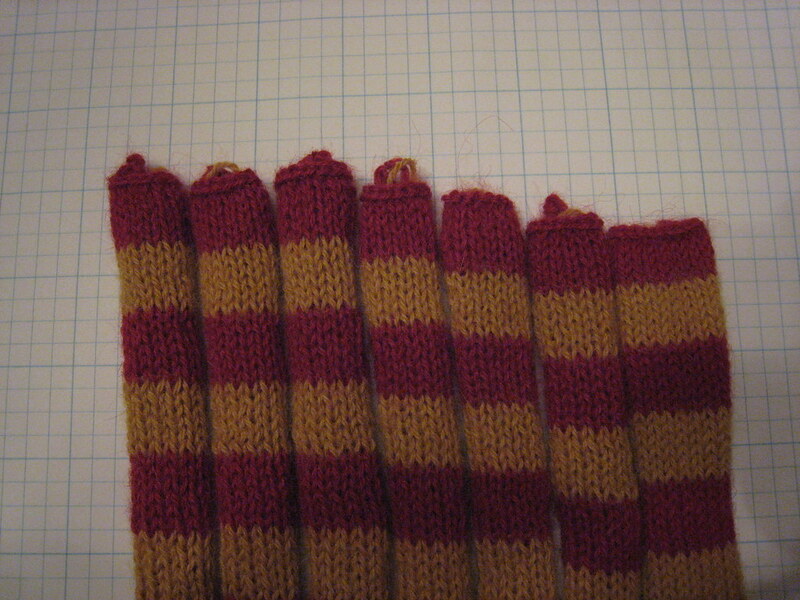 First are the Harry Potter Bookscarves out of the Charmed Knits book. 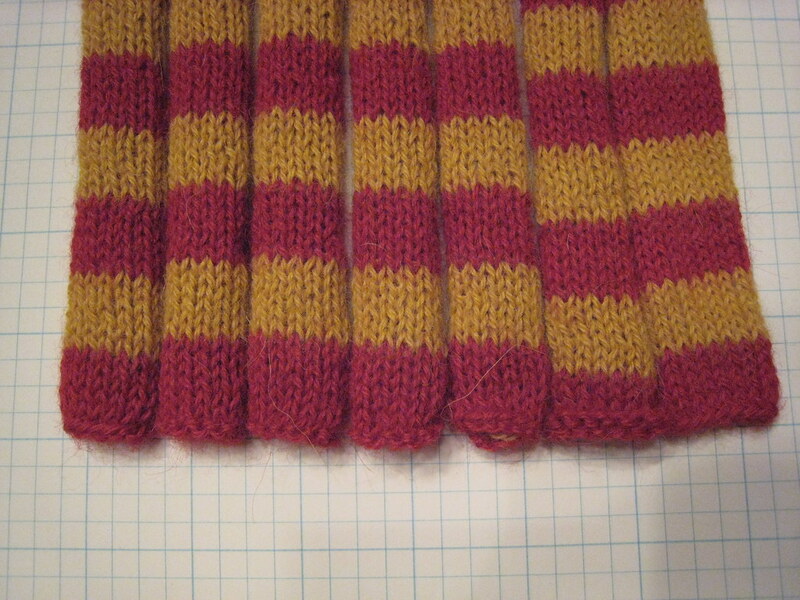 This is the same pattern, same yarn, same needles for all bookscarves. I even made the exact same pattern modifications in every single one. And here are the tops of those same bookscarves. Next up: Elizabeth Zimmermann’s Baby Surprise Jacket. I started with Cascade 220 Superwash on size 7 needles. But I decided the fabric was too tight (especially for Los Angeles) and went up two needle sizes to a size 9. The fabric was much more relaxed and more what I was looking for in a sweater. But here’s the catch. 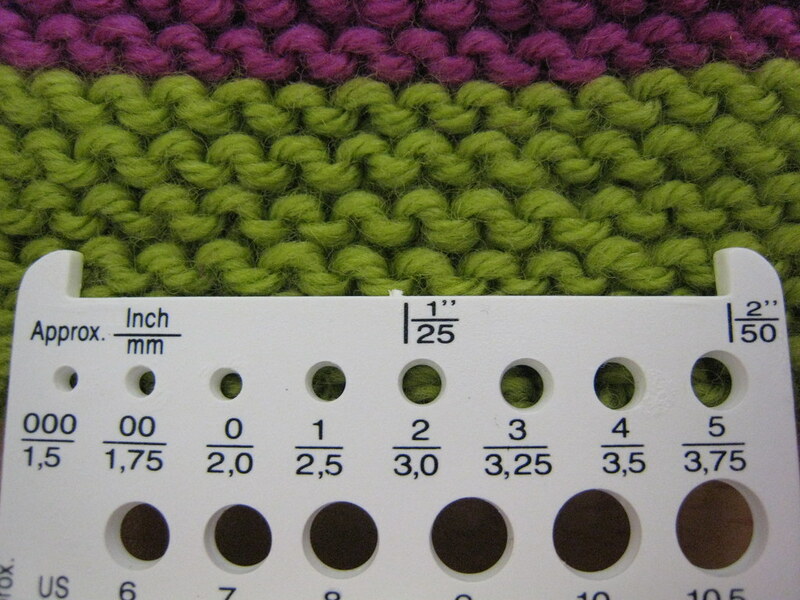 The stitch per inch count was almost exactly the same. I knew you all wouldn’t believe me (heck, I don’t believe me!) so here’s photographic evidence. Like I said…A filthy stinking liar. 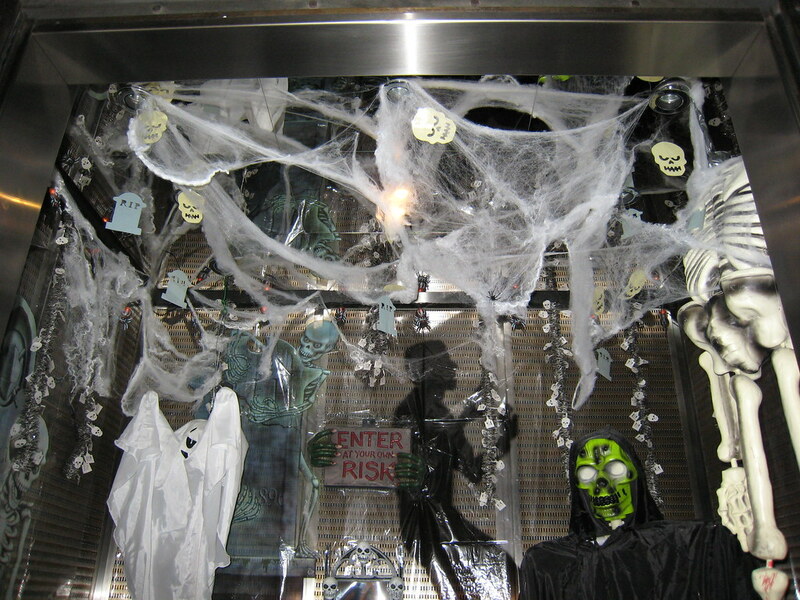 The Office of the Building here at Lawyer, Lawyer, & Lawyer decorate for Halloween in a most unusual way. I love it! 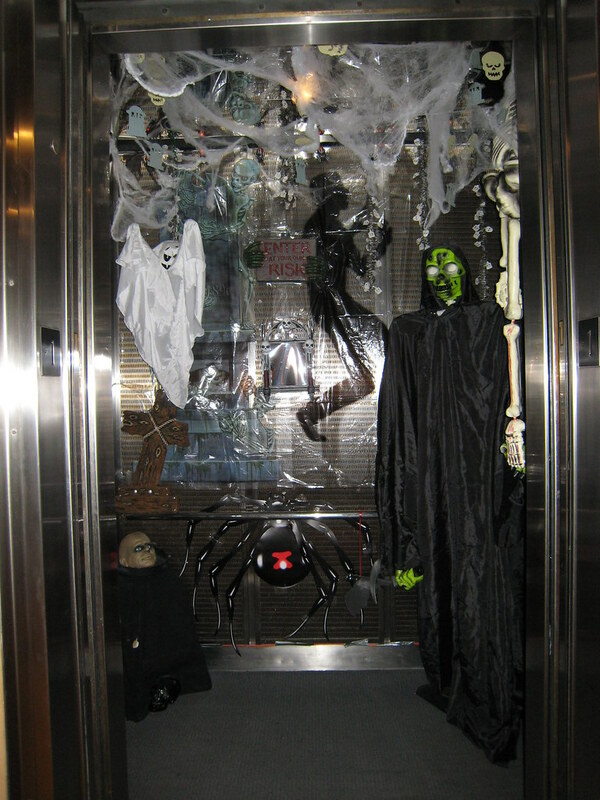 Spooky Elevator!!! October has ended, and not a moment too soon, in my opinion. It has been a month of loss in all sorts of ways, from the loss of Greg, to the loss of my belongings when thieves broke into my house, to the loss of a quilted, embroidered garment that my mother was working on for her friend Rachel‘s show, to the loss of lung capacity because of the fires. It’s been a month of loss on both a large and small scale, and I am so very glad October 2007 is OVER. Let’s hope for a better November, eh? In the meantime, I have joined NaBloPoMo (National Blog Posting Month) and the goal is a post a day for a month. (Stop laughing, Mom!) We’re off to a semi-good start. It’s 11:09 p.m. right this moment, and here I am…posting the first post. They may not be as eloquent as some of my past posts, but I’ll hopefully be prolific. Of course, it may be light on the pictures, as those ratbastard theives took my camera charger when they took my computer bag. 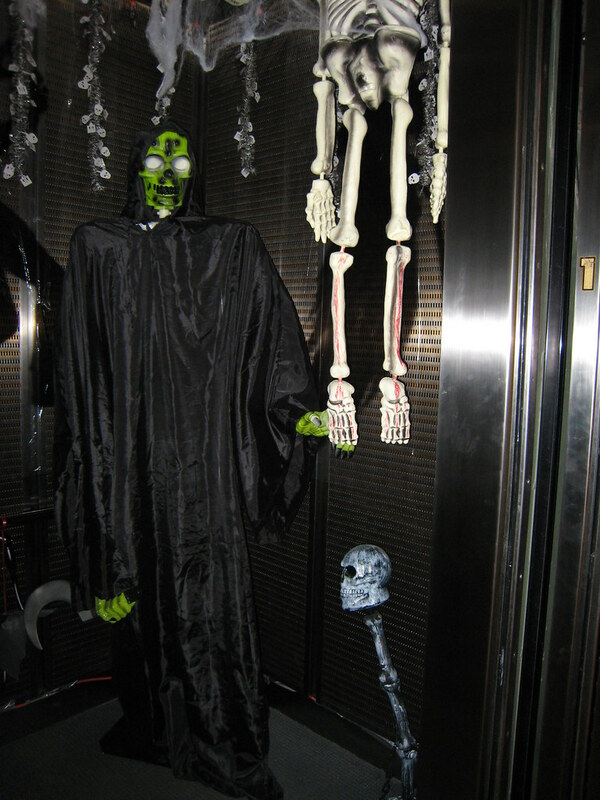 Ah, well…October is over. On to November and (hopefully) a less dramatic month.